This past weekend to help kick off our three day weekend because of Martin Luther King Day, we headed down to the Cape to visit friends and to try out a new whisky bar called Oak and Ember in Mashpee, Ma. Anytime I hear whisky bar I am all about trying it out and seeing what whiskies are in their menu. For whisky I decided to go with their Last in Translation flight, which included three Japanese whiskies. One of those three whiskies was the Yamazaki 12 year. Before I get into the whisky, I’ll point out that although I enjoyed the company and the whisky, I didn’t enjoy the meal. It was one of the driest lobster risotto’s I’ve ever had in my life. It also felt as if they just threw the lobster on top of the risotto as an after thought. Now don’t get me wrong, I believe there were some dishes at our table that people enjoyed. I just didn’t enjoy mine. What made the dinner better was the whisky and the one I am highlighting today is Yamazaki 12, which is produced by Suntory Whisky. If you aren’t much of a whisky drinker and are wondering where you could have probably heard about Suntory, they are the Japanese whisky company that just announced they were purchasing Jim Beam. Suntory Whisky first established its whisky distillery in 1923. Their distilleries include Yamazaki and Hakushu. Their products include Yamazaki, Hakushu and Hibiki (see my Hibiki post on my Sept. 5, 2013 post http://wp.me/p3Zt2k-S). Per the Suntory site, Yamazaki is their “number-one” single malt whisky. In their range they have this 12 year-old, an 18 year-old and a 25 year-old. If you have never had Japanese whisky before then I suggest you eventually try it. I enjoyed this 12 year-old, as much as I enjoyed Hibiki. Yamazaki 12 has a nice golden color to it. If you were to purchase you would see a different range of prices but I mainly saw them between $40-$50. Nose: The smell was sweet; I made out notes of honey and vanilla. Taste: Was woodsy and spiced. Finish: Extremely smooth! It was light and extremely tasty. I very much enjoyed this whisky. It has sweetness, lightness and smoothness. I definitely recommend trying out a Japanese whisky if you have never done so. If not this Yamazaki, then maybe their Hibiki. Japanese whisky has certainly become more and more popular over the last few years. They have shown us that they are certainly here to stay in the whisky market. If you have tried it let me know your thoughts. I would love to hear them. 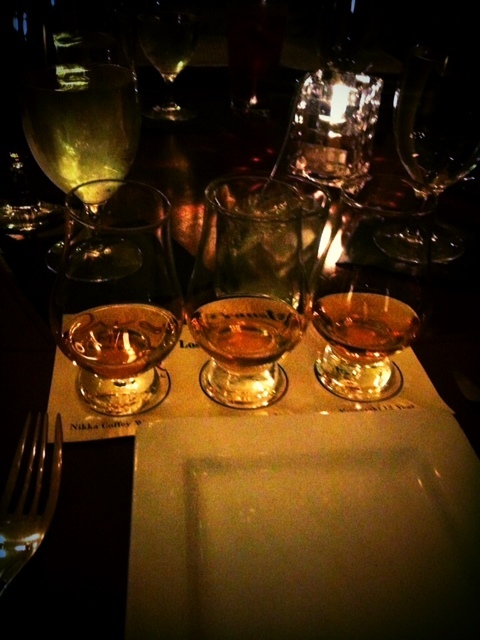 The Yamazaki 12 is the third dram you see pictured in this flight.